Are you wondering why your running shoes resemble high heels? Ever think about why your big toe overlaps your second and why your arch really isn’t an arch anymore and resembles more of a pancake? Thinking about baring your sole? Barefoot training has recently become popularized as a potential benefit in injury prevention and rehabilitation programs. It is also purported to serve as an additional means to enhance athletic performance and running economy. However, limited clinical research is currently available to justify this practice and even less information is available describing how one may go about safely implementing a barefoot training program. This book explores the scientific and theoretical benefits concerning the merits of forgoing the modern running shoe for a simpler approach and offers real life solutions to all the obstacles standing between your feet and mother earth. Although it’s true that Americans love their shoes, what you learn about the merits of stuffing your feet and toes into these modern day casts might just have you singing a different tune – a tune your feet will certainly be much happier moving to. Welcome to Barefoot in Boston! Enjoy Born to Run author, Christopher McDougall's TED presentation below! 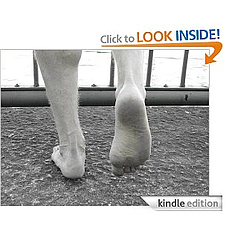 Learn how you too can enjoy the benefits of being barefoot by reading BAREFOOT IN BOSTON, available now in both paperwork and kindle.